According to reports, the Arizona Coyotes are set to announce John Chayka as their new general manager. Chayka is just 26-years-old and will replace Don Maloney, who was fired in April. The new general manager will be the youngest in NHL history. The team is expected to make the announcement on Thursday at a press conference. 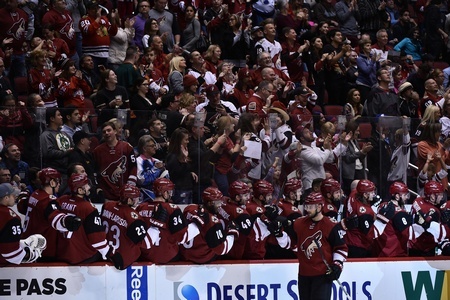 The co-founder of analytics firm Stathletes, Chayka was brought in to the Coyotes organization last year as the assistant general manager in charge of analytics. Prior to that, he spent 101 games as a player with the Woodstock Slammers of the Maritime Hockey League. The NHL has been trending toward analytics for a while now, but Chayka’s hiring as general manager is the biggest of its kind. Consider Kyle Dubas’ hiring with the Toronto Maple Leafs. The 30-year-old is the assistant general manager of the Leafs and the general manager of the Toronto Marlies, but his affinity for statistical analysis tilted the scales in his favour. Since being hired almost a year ago as the assistant GM for the ‘Yotes, Chayka has had found involvement in various areas of the organization. He’s been part of player evaluation and has provided coaching support – like with a heavy mind toward analytics. The Coyotes are also restructuring the front office, which means Chayka will have some help. Head coach Dave Tippett will have an “increased role” with the club in terms of player personnel and the transition could help ease Chayka into the post. Arizona was always going to go in this direction and they apparently had some interest in Dubas, who wasn’t ready for a general manager role. The Coyotes also spoke with Les Jackson, the assistant manager of the Dallas Stars, but a deal couldn’t be reached. Chayka will have some work to do when he gets started. Shane Doan is on the list, with the 39-year-old still set to decide on whether or not he’ll play another year. And some are suggesting that Mike Smith is on the decline, despite a hefty contract. The Coyotes haven’t made the post-season since 2011-2012, so Chayka has his work cut out for him.